The Annual Catholic Appeal is about being Catholic and recognizing there are priests and deacons to be trained, social services for the needy and poor to be offered, Catholic schools to sustain and grow, retired priests and nuns to support and so much more! The Annual Appeal allows you to join thousands of Catholics to support these needs. Click the button above to make your donation now or keep scrolling learn more about Annual Catholic Appeal 2018. 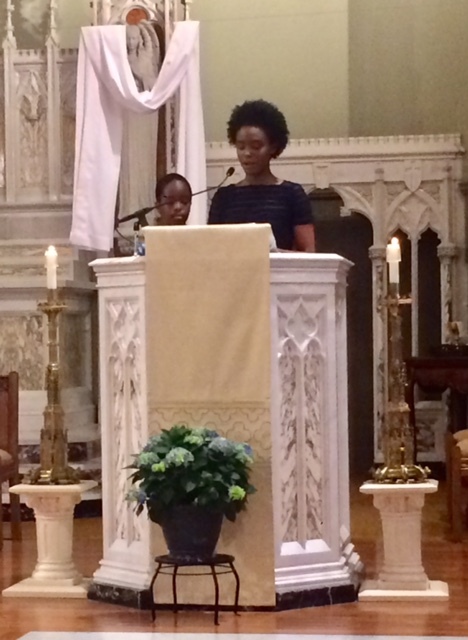 The 2018 Annual Catholic Appeal kicked off on April 28-29, 2017 with a witness talk at Mass. Arianna and Jeremy Njongek, children of Andrew and Locky provide testimony on why all Catholics should prayerful consider a gift to the 2018 Annual Catholic Appeal. Missed the talk at Mass? Listen now. What does the Annual Catholic Appeal Support? The Annual Appeal is an Archdiocesan campaign that reminds Catholics that we are part of the larger Church and not just the local parish. By all parishes working together to provide support to over 60 ministries and services throughout Western Washington, we are accomplishing what we cannot do alone. 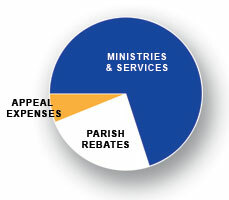 How does the Annual Appeal differ from my Parish Stewardship Giving? 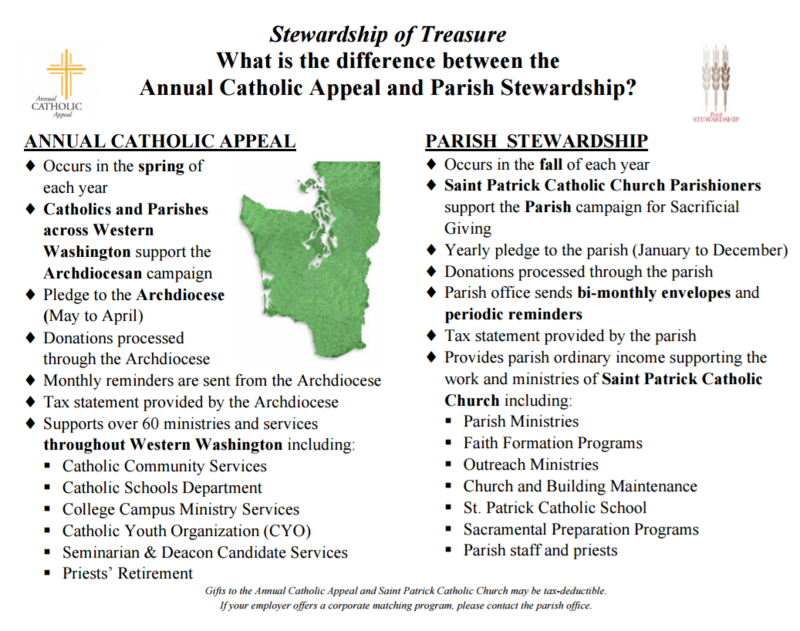 Both Annual Catholic Appeal and Sacrificial Giving (also know as Parish Stewardship Giving) are part of Christian Stewardship— Stewardship of Treasure. Stewardship is a way of life, not a program that has a beginning and an end. Stewardship calls us to share a portion of our TIME, TALENT, and TREASURE so that the Good News of Jesus Christ may be shared with those who do not know Him. There are 175 parishes and missions in the Archdiocese, serving 579,500 Catholics. When you give a gift to the Annual Catholic Appeal, your money goes to support over 60 ministries and services . Have you ever wanted to see the hands, faces, and places of the Annual Catholic Appeal in Western Washington? 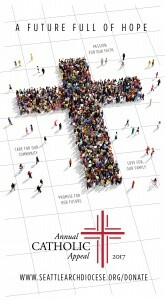 Your Church supports many ministries and services throughout the Archdiocese – made possible by YOU! 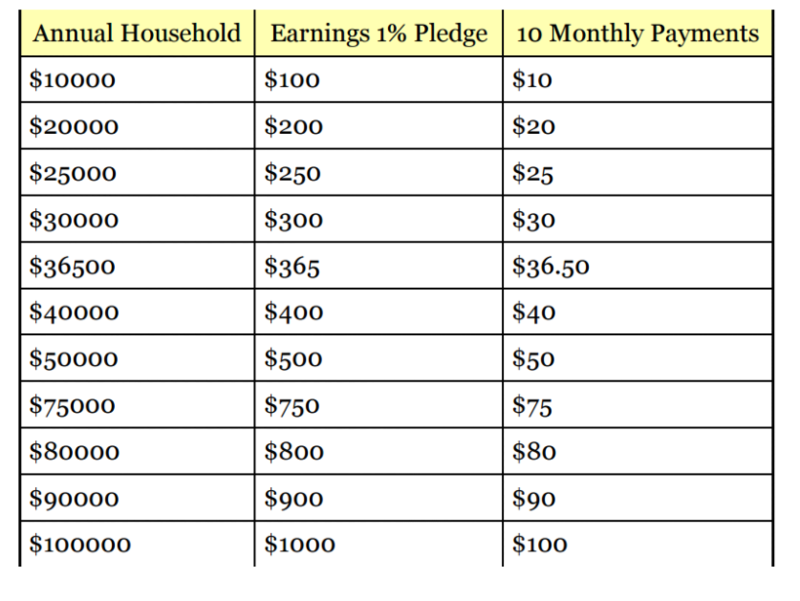 How Does Saint Patrick Catholic Church Benefit? Parishes are direct recipients of the ministries and services supported by the Annual Catholic Appeal. In addition, any money received exceeding the parish assigned goal is returned through a rebate to the parish to use for a stated project or as needed. There are many ways that you can give to the Annual Catholic Appeal. Pledge – submit your pledge (through the pledge card, envelope or online) and you will be sent monthly reminders. Donate through your IRA – contact your IRA administrator and have your gift sent directly to the ACA Office | 710 9th Ave | Seattle WA 98104 – include your name, ACA ID# and the parish you want the gift credit to go to. Consider donating 1% of your income to support the Church in Western Washington through the Annual Catholic Appeal. The average archdiocesan gift to the 2017 Annual Catholic Appeal was $385. If you are able to participate this year, would you consider a gift of at least a $1 a day or an annual gift of $365 or more? Gifts of any amount are welcome and your gift will make a difference in the lives of thousands of your neighbors— Catholic and non-Catholic alike. If you are unable to give a monetary gift, consider giving the gift of prayer— which you can indicate on your pledge card. Can your gift be doubled? Saint Patrick Catholic Church’s portion of the $11.7 million Archdiocesan goal for the 2018 Annual Catholic Appeal is $115, 807. Last year 378 donors raised over $110,000. This year our goal is to increase our numbers of donors generously supporting the Annual Catholic Appeal. Our true goal is 100% parishioner participation— 1200 donors— whether it is a financial gift or a gift of prayer. Not only does Saint Patrick Catholic Church want to increase the overall number of donors, we also want to increase the over all gifts received online using a smart phone, tablet, laptop or desktop— internet/mobile gifts. By making your donation online— you save the parish time and money— because the donation is received directly by the ACA office at the Archdiocese of Seattle. There is no lag time and your donation will be received and recognized in parish communications quickly since there is no delay in processing. In addition to receiving your gifts online— we ask that you make your donation early— and save the parish the time and cost of follow-up mailings. Your support is essential to our mission and the mission of the overall Church – without YOU, there would be no Church. Thanks to your generosity, our Church is here in times of need providing comfort and hope. In addition, if the goal number is achieved and exceeded, the faith community will realize a few benefits too. Contributions above our parish goal of $115,807 will stay in the parish in the form of a rebate from the Seattle Archdiocese. The 2016 rebate was used improve handicap accessibility at the Church. Two additional handicap door openers were installed— one for the door entering the main sanctuary of the Church and the other for the door to the ground floor entrance off the handicapped accessible parking, by the elevator. Together we will continue to accomplish great things in the name of our Lord and His people at Saint Patrick Catholic Church— ensuring that all are welcome by way of these enhancements.